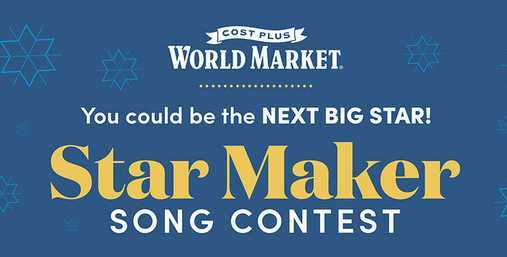 Cost Plus World Market has teamed up with Universal Music Group and Brands (UMGB) to bring you the Star Maker Song Contest where they will be giving you the chance to win a trip for two people to Los Angeles, CA which includes hotel accommodations, $1,000 World Market Gift Card and more. How To Enter: Go to this link:worldmarketwin.com during the sweepstakes period and follow the online instructions to record a video of yourself singing the song “Santa Claus is Comin’ to Town”. You may sing the song (i) using your own original musical accompaniment; (ii) using the instrumental soundtrack provided on the website; or (iii) a cappella without instrumentals after this register by entering all information requested on the registration form. Prizes: One lucky grand prize winner will win a trip for him/herself and one (1) guest to Los Angeles, California. 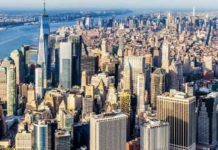 trip Includes: round-trip coach class air transportation, hotel accommodations, $1,000 World Market Gift Card. Total ARV of grand prize is:$14,550; RUNNER-UP PRIZES (3): A $500 World Market Gift Card; THIRD PRIZES (6): A $100 World Market Gift Card. 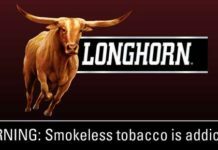 Who Can Enter: Open only to legal residents of the 50 United States and District of Columbia who have reached the age of 13 years old at the time of entry. 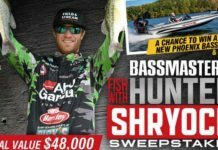 When To Enter: This sweepstakes entry begins at 12:01 a.m. Eastern Time (“ET”) on November 19, 2018 and ends at 11:59 p.m. ET on December 08, 2018. Who’s Sponsor: The Cost Plus World Market Star Maker Song Contest is sponsored by Cost Plus World Market, 1201 Marina Village Parkway, Alameda, CA 94501.